ANALYSIS: TRUE. 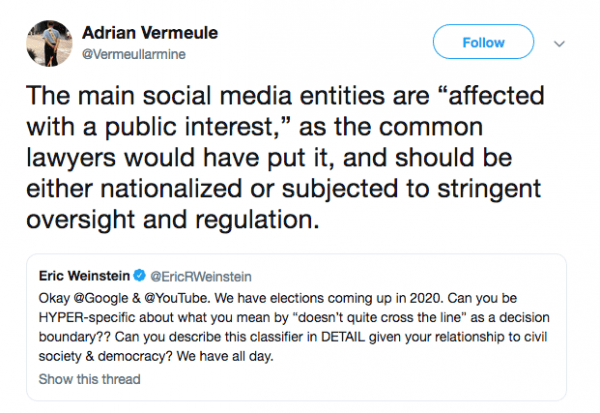 Google And Facebook Worsen Media Bias. More than two-thirds of Americans get news from social media. Google and Facebook control a large majority of the digital advertising market that used to be a major source of revenue for the news industry. Tech companies have leveraged their control of news distribution to entrench their advertising dominance. Facebook’s Instant Articles publishes the full text of an article in the platform and shares ad revenue with the publisher. Google punishes publications that raise revenue through subscriptions rather than advertising by downgrading search results of paywalled sites that don’t provide free clicks. Google loosened its restrictions after criticism from publishers and threats of European antitrust enforcement, but it also introduced a “Subscribe With Google” service. . . . While antitrust law focuses on economic effects, the Supreme Court said in Red Lion Broadcasting v. Federal Communications Commission (1969) that it also complements the First Amendment’s “uninhibited marketplace of ideas,” which does not “countenance monopolization of that market.” The antidote to media bias isn’t schadenfreude over a few publications’ travails but antitrust policies to ensure news outlets across the political spectrum can be independent of Silicon Valley. Related: Donald Trump must bust Facebook, Amazon, Netflix, Google monopolies like Teddy Roosevelt.